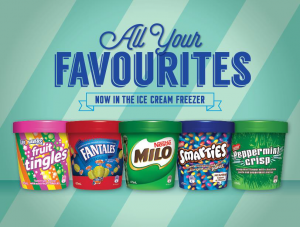 Peters Ice Cream Australia is now selling ice cream tubs inspired by Nestle confectionery brands. Nestle Australia formerly owned Peters Ice Cream between the mid-1990s and 2012 when it sold the brand to Pacific Equity Partners for an undisclosed sum. Peters was then sold to the UK-based R&R Ice Cream in 2014. Despite the sale, Peters and Nestle have still been able to work together and utilise the power of both brands. By combining efforts, the two brands can maximise sales throughout the year. It has always been known that ice cream and chocolate are counter-seasonal, with ice creams being a hot seller in summer and chocolates being a hot seller in winter. However, this partnership allows each of the brands to maintain and expand their presence throughout the whole year by offering the combined product. Peters and Nestle have already been working together for years to create the single-serve “Milo Scoop Shake” typically sold in convenience stores, milk bars, canteens and petrol stations.